We welcome the one-of-a-kind special. 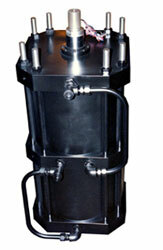 Custom designed cylinders for those special or difficult applications are an important part of our business. 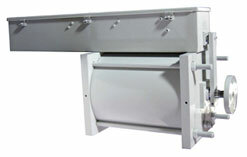 We have manufactured cylinders with special features: unique mounting requirements, tandem force cylinders, underwater operation, non-rotating rods, high-temperature applications, locking cylinders, composite materials, position sensing cylinders, alternate operating media cylinders, large bore cylinders, and custom engineered spring extend or spring retract cylinders, to name some. 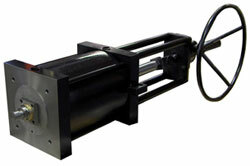 Among our innovations: The Miracalube ® self-lubricated air cylinder. Its lubricant is made of FDA approved materials and does not mist into the atmosphere. Over 50 million linear feet of piston travel have been reported in case histories! Among our features: Limit switches can be tie-rod mounted on our medium duty hydraulic cylinders and some high pressure cylinders. This is unique in the industry, allowing sensing to be set anywhere along the stroke without external mechanisms. All of our product line – from the air and pneumatic cylinders, to boosters and intensifiers, to valve actuators, to spring extend and spring return cylinders – are offered in stainless steel construction inside-and-out. This means all the parts – tube, rod, bearing housing, tie-rods, tie-rod nuts, piston, open and closed heads – are 100% stainless steel. 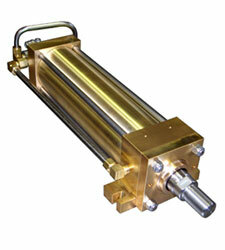 Spring return or extend cylinders, often used in fail-safe applications, are routine for us. 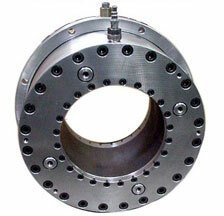 But maybe you are looking for that particular design for your specific application – a real special. We have a long history of producing custom designs. This page shows just a few of the thousands of special actuators that Lehigh has manufactured. Let our engineering department work with yours to design the actuator you need for your specialty application. 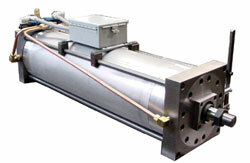 HYDRAULIC & AIR CYLINDERS LEHIGH Fluid Power Custom & Specialty Cyl.